Biological Stains are the colorants that find usage for biological reagents and biological stains. As leading name in this area, we ensure customers get quality dyes that can be made available with support of BSC certification. These are used in medicine and biological research laboratories for highlighting structures in biological tissues so as to view them more conveniently with support of microscopes. The stains can be used for examining cell populations, organelles within individual cells and others. With consistent quality delivered each time, these in-stock products can be made immediately available. 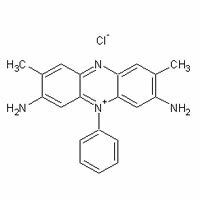 Safranin O is the cationic dye that finds usage in medical field for staining acidic proteoglycan that are present in cartilage tissues and work as indicator cell chondrogenesis. The Safranin O stain is available in powder form which makes it easily dissolved in de-ionized water for making staining solution. When bound to glycosaminoglycan, Safranin O shows orange-red color. Diethyl Safranine finds application in cytology and histology fields where it is used as counter stain in some of the staining procedures including coloring of all cell nuclei in red color. Further, it is also suitable for detection of mucin, mast cell granules and cartilage. 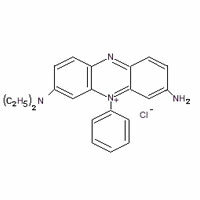 Chemical Name 3-Amino-7-(diethylamino)-5-Phenyl Phenazinium Chloride.